Studio Dust Palace offers a friendly and fun atmosphere for people of all ages. Relax with friends, artists, musicians and other creative souls. Studio Dust takes pride in being a friendly and welcoming place where everyone is invited to sit on the big front porch in the front room with friends or stir up some creativity in the studio rooms. Several of our friends have musical works "on display" in our "Featured Performers" rooms. Tell some jokes in the "Comedy Club", vacation on "Studio Dust Island", relax on the "Nature Trail", or follow the "Path to Romance" where we have an animated Tunnel of Love. For some friendly competition and amusement, we have several game rooms including the popular dice game, Yahtzee. Just for fun we maintain a real-time list of high scores. Come sail to an island with us. Studio Dust also has several Avatar dispensers for your prop-shopping pleasure. You'll find male and female figures, island attire and animals. We even have avatars of our personal pets, both real and imaginary. If you have the stand-alone client installed, come visit using the button below. If you do not have the Palace client come visit via Instant Palace using the button below. ... is another Palace hosted by Studio Dust. Nobody's Home is designed and run by and for kids. There are lots of cool rooms to hang out in, games, avatars and fun effects. You're sure to enjoy chillin' and stompin' at Nobody's Home. Come say "hi" to the friendly staff. They'll be happy to show you around. To find out more, visit Nobody's Home Page. Palace is an interactive, graphic chat program. You and those you are chatting with appear as images and names called Avatars. The chat messages appear as cartoon-style talk balloons. Some people are quite creative at making their own Avatars. The chat rooms at each Palace server are pictures with active spots such as doors linking to other rooms on the server, Avatar dispensers, animations, sounds and other interactive things. The company that owned the software and rights discontinued providing support for The Palace in the Fall of 2000. Thanks to a dedicated group of users and programmers, the Palace community has continued to provide support and guidance for new and experienced Palace users. One of the first groups to provide a home for the Palace community was The Palace Developers Group. Another group of users and programmers acquired the use of the ThePalace.com domain name and they provide a source for information and software. Other resources for Palace information are listed below. The stand-alone Palace Client program offers the most features and is compatible with Windows and Macintosh. This software and registration codes are still available at some download sites. If you do not have the stand-alone client program or the TPV java applet, you can still visit Studio Dust Palace using the Instant Palace java applet. Instant Palace is not a complete implementation of the Palace interface - the audio presentations will not work and you cannot wear Avatar pictures other than smiley faces. But you can choose your own name, see the background pictures and chat with the other visitors. Some resources, tools and programs for Palace users and operators available from Studio Dust and elsewhere. User Software, Manuals and more ... Links to sites for downloading Palace Client software for Macintosh and Windows plus manuals, registration codes, backup prop and cyborg files. Graphics Tools Links to graphics software and color palette files for making pictures and avatars for Palace. Audio/Sound Tools Links to audio editing software to make sounds for Palace. RiffMp3 Program to modify MP3 sound files to play for Windows Palace Client. The new Palace.com WEB Site A resource center for The Palace. Palace Tools WEB Site A resource center for The Palace. The Practice Palace WEB Site Lots of help for new seasoned users including a well done First Time User Guide, Palace software and manuals, and many links to useful resources. The Palace Planet WEB Site Another source of Palace information, with tutorials, an open forum and downloads for software and manuals. Palace Developers Group A mailing list of Palace developers and users working together to support the Palace community. You must sign up with Yahoo Groups to join this forum. 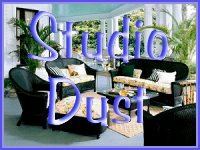 Contact Studio Dust Palace If you have any questions or comments about Studio Dust Palace, please use the link below to send a message.